Here is wishing you a Happy Halloween with this Lollipop Candy block. Candylicious? Don’t forget to check in tomorrow for the block pattern! Meanwhile, have a scary, spooky day. Author MadsPosted on October 31, 2014 April 13, 2018 Format ImageCategories Dreamcatcher Rainbow Round the Year, Patchwork of my life, Round the Year quiltTags Block of the Month Quilt, Circles in quilts pattern, Dreamcatcher Quilt, Foundation paper piecing, Free Quilt BOM 20142 Comments on Trick or Treat? I can’t resist sharing a peek at the next block, which will be posted on the first of the next month! Probably, my favourite block. 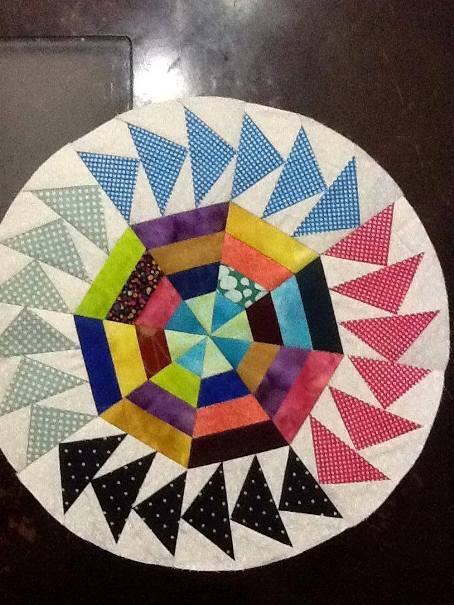 This is Rainbow Venus, Block Five of the Block of the Month Quilt, Round the Year. I have named it after the birth star for those born in October, like my husband and son! 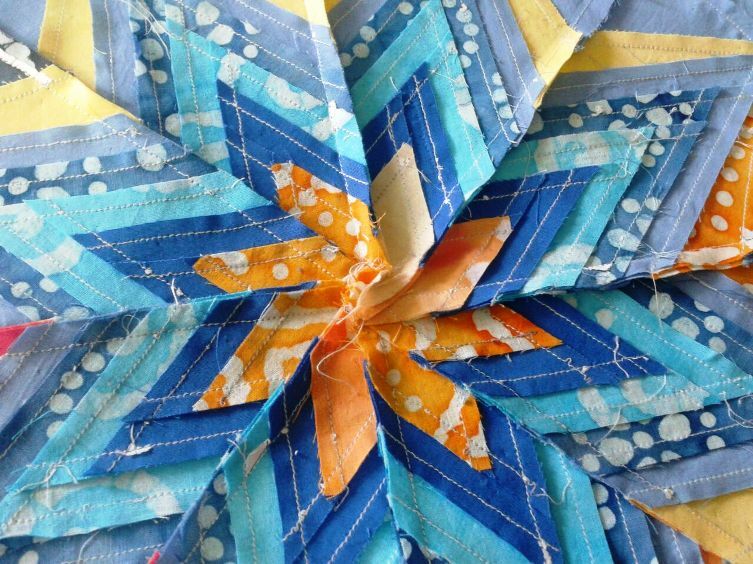 Completely paper pieced, It is inspired by the beautiful folded star, which is made by folding squares or circles of fabric around a centre point. The block is 18′ square with a 15″ inset circle. 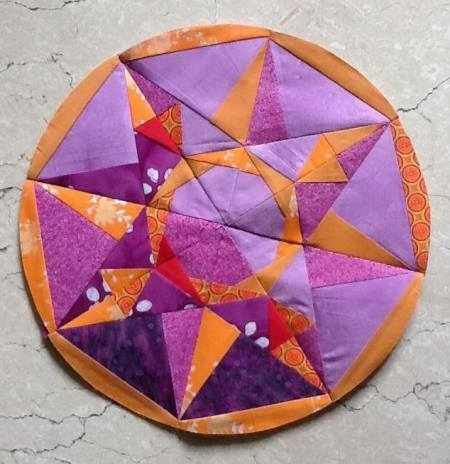 The paper piecing templates and instructions for piecing and assembly can be downloaded in pdf format from the links at the end of this post. I used Quilt Assistant free software to design this block. 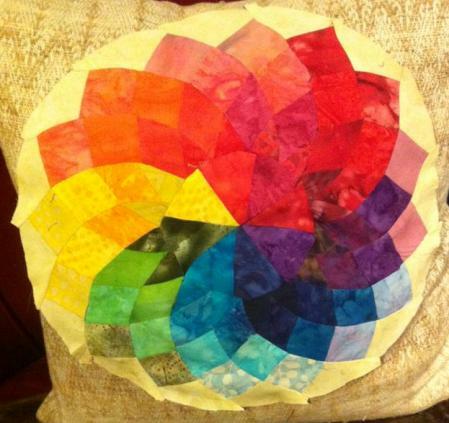 The quilt itself is being designed in two colourways, Dusk and this one, Rainbow. Would you like to see the Venus at Dusk? You can do that and download the pattern from this link. To get back to the Rainbow Venus, the colour design above uses a black and white geometric/ text modern print to set off fluorescent or bright coloured solids against a blue background, and a hint of grey. I like to nicely starch and press my fabric before cutting – besides pressing after each step of piecing – to ensure a neat, crisp finish to my block. By the way, the `x’ in the chart after each Fabric number refers to the number of pieces of the fabric you need to cut. Just so that you can boast about it, there are 112 pieces in this block! Important – If appliquéing the circle to the background, you need a 19.5” square of fabric#1 instead of 18” x16” specified in chart; do not cut fabric according to templates I and J. Print the Instructions file and keep it at hand. Print all templates from the Templates File in portrait mode at actual size (or 100%) setting on your printer. Note that I have provided only one template of each kind– (viz A. B. I and J) – whereas you need four of each. So you can either print four copies of the templates file, or use any method you like ( like tracing or needle punching) to replicate the templates. If you plan to applique the circle to a background square, do not print the templates I and J on the first two pages of the Templates File. I like to cut out the templates just a little larger than printed and trim to size after piecing. For this block, one can use a rotary cutter for trimming the straight sides after piecing, for a neat finish. The 8 templates A to H are pieced like individual two-sided log cabin blocks, beginning with the centre piece as Piece#1. Align the straight edge of the strip with the printed seam line at each stage. It saves time if you work on all the templates at the same time. Complete the piecing at each step, trim the seams and press, before moving to the next step. Join the 8 wedges to respective background pieces using the colour design and the Master template as a guide. Join in pairs to make the 4 squares that make up the block. Assemble these to make up the full block. The Master Template is a mirror image of the final block, which should not really matter here, as the design is symmetrical. Step by step piecing instructions, with photographs, are available on this post with the Venus at Dusk pattern. I leave you to consider two more options that I liked, when designing this block. Or, you could try out your own colour combinations on the Master template. Here are the downloadable pdf pattern files. Happy star gazing! Instructions File and Fabric Requirements for Rainbow Venus, Block Five of the Round the Year Quilt. I find the folded star so very pretty and you see it everywhere these days! The reason that I could never get around to making it is that … as much as I may hate to admit it… I am a fabric miser! Therefore, I designed this paper pieced block, inspired by the folded star and named it Evening Star. 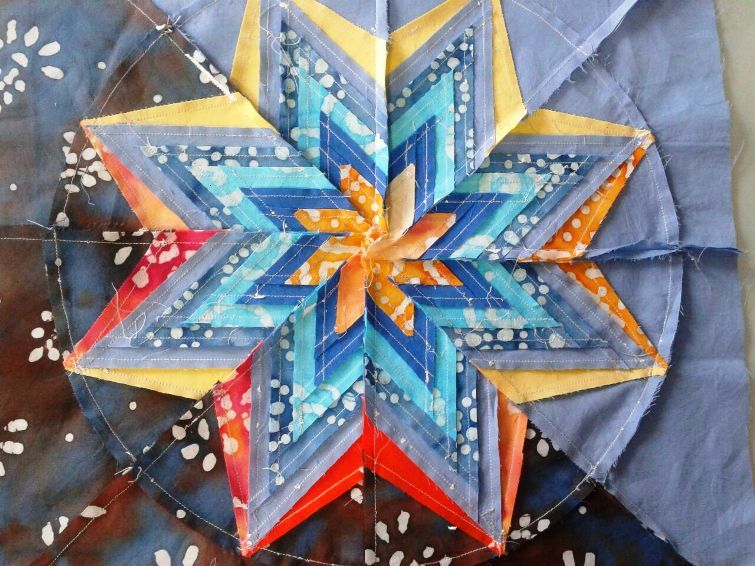 There is already a quilt block with that name, so I thought of calling it `Morning Star’, but in Hindu mythology the Morning Star is the North Star, not to forget that this quilt is called “Dusk’! I also wanted to dedicate this October Star, Venus, to my husband and son, whose birthdays fall this month. And then, Indian scientists decided it for me by sending a mission to Mars; if men now have a place to head to, we women need our very own Venus! So…introducing Venus, Block 5 of the Block of the Month quilt ” Round the Year”, designed in two colourways, Dusk and Rainbow. I used Quilt Assistant free software to design this block. This colour design shows the ‘Dusk’ Colourway in four shades of the main colour (blue here) and four shades ranging from yellow to deep orange in the contrast colour. 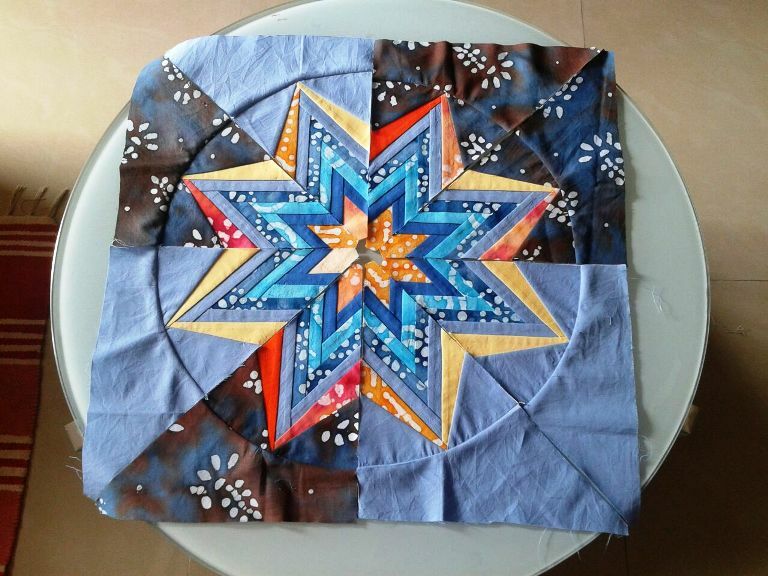 My contrast colours are not symmetrical, because I liked the idea of a twinkling star, please make necessary adjustments in the fabric requirement if you want a `steadier’ star. Print all templates in portrait mode at actual size. Also print the first two pages of the Instructions file and keep at hand. If you want to refer to the step by step piecing and assembly instructions, print the whole file! The links are at the end of this post. Number and label each fabric colour. You can use the master template given below for trying out colour combinations. I like to cut out all the pieces of one colour and pin them to the respective templates before I move to the next colour fabric. This helps me avoid a lot of confusion and heartburn later! I suggest you piece the 8 templates A to H like log cabins. Align the straight edge of the strip with the printed seam line at each stage. It saves time if you work on all the templates at the same time. Complete the piecing at each step, trim the seams and press, before moving to the next step. 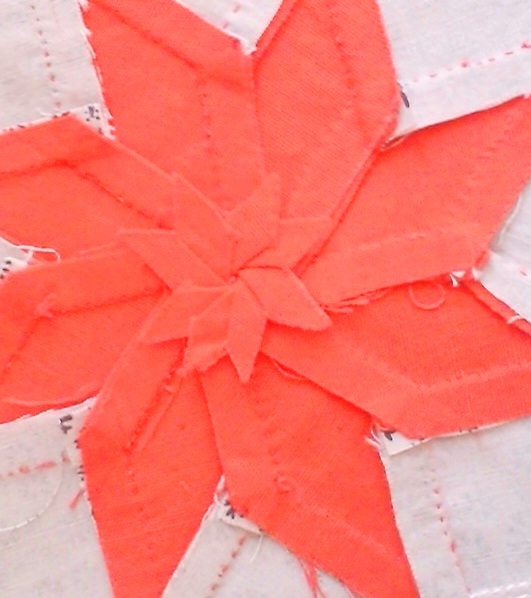 For more tips on paper piecing the blocks of this quilt, refer to this blogpost! Join the 8 wedges A to H to respective background pieces using the colour design and the Master template on Page 1 as a guide. Join in pairs to make the ¼ squares. Assemble these to make up the full block. Here is the Master template – this is a mirror image of the colour design and shows the block from the printed paper side. Anuradha Bahuguna of anumrinal.wordpress.com was sweet enough to test the block for me! All these pictures were taken by her. Would you believe this was her first attempt at paper piecing? Like I said, the block templates A to H are pieced like individual log cabins, beginning from the centre ( yellow to oranges here). 1.I would recommend you sort out all the pieces template-wise and pin them to the far end of your template ( near the piece # 10-11) in the order of stitching – the longest piece at the bottom of the pile and the shortest on top. For convenience, I am giving the piece number, size of the piece and fabric number here. 2. So we start with the 1.5″x2.75″ piece and pin it on the unprinted side of A1. The wrong side of the fabric should touch the paper at all times. Note that the fabric extends at least ¼” beyond both seam lines, adjoining A2 as well as A3. Align the long edge of the fabric to the seam to be stitched – in this case between A1 and A2. Do this for all pieces to come. What I am going to show you now is incorrect, because the ¼” margin is not available toward A2. Now place the 3″ x1.25″ fabric #3 on the just pinned piece, right sides together, and long edges aligned at seam A1-A2. That seems fine – all margins covered! Anuradha has pinned it on the seam allowance to check that fabric for area A2 completely covers it when opened. In the next picture she shows us how it looks from the flip side. Set the sewing machine to a stitch length between 1 and 1.5 so that it is easy to tear away the paper. Sew on the seam line A1-A2, extending the stitching line about ¼” on to A3. Similarly stitch the first two pieces on all the templates, before heading to your ironing table and pressing the seams to set them. Then trim the seams to ¼” and open the piece #2 on all templates. which is fabric#3 and 3.5″ long, right side down, aligning the long edge to ¼” beyond the printed seam line between A1 –A2 and A3, the way you would in a log cabin. Do this for all the templates and then do the stitching of piece #3 to pieces #1 and #2. Press seam to set. Fold away the paper template after stitching the seam and trim the seam to ¼” before pressing open piece #3. Checking if pieces # 4 and 5 in place? 5. Sew pieces # 6 and 7 to each of the templates. 6. Here comes Piece#8. It will be followed by piece #9. …the final blue pieces# 8 and 9 attached! 7. Turn of the golds! Anuradha was a bit confused here, so she coloured the pieces 9 and 10 with pencils! Remember – the master template is a mirror inage? Coloured pencils ensure you don’t get confused! Not for long though! She attached the yellow to orange pieces at Areas # 10 and 11. 7. 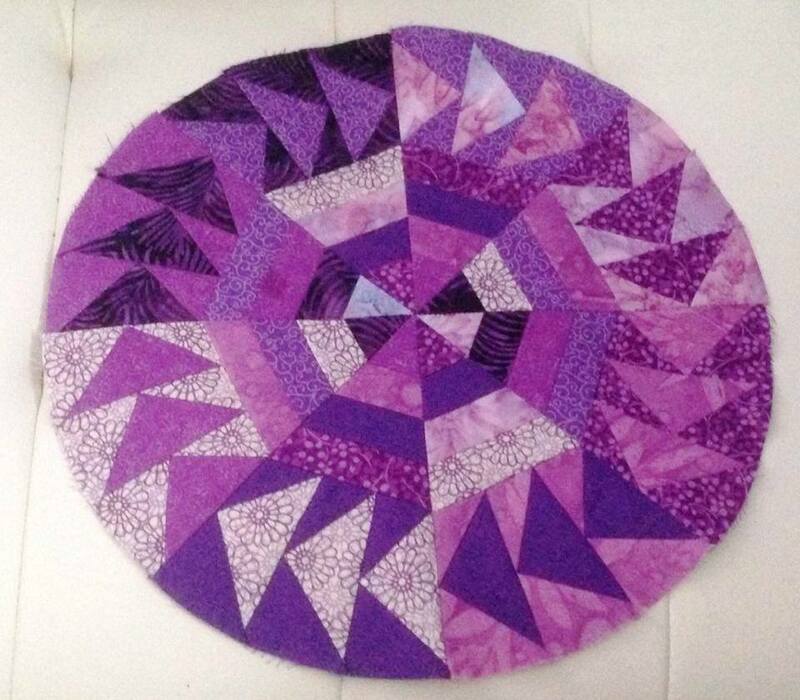 Here are her eight wedges, that will make up the 15″ circle, all pieced! The pattern suggests that you join each of these eight large pieced wedges to a corresponding background piece. While I suggest a diagonal kind of dark/ bright background, Anuradha wanted to experiment with other `looks’. Time then, for some more confusion, while Anuradha tried out various settings for her circle! This..hmmm…I quite like this..
Light against dark and dark against light! Light against light and dark against dark! but changed her mind! She joined these wedges into pairs to make four squares. The squares were joined ( like a four patch) to make up the final block. Here it is from the wrong side, withe paper removed! Anuradha does not care much for the centre of her block from the back. It refuses to lie flat. The centre needs some work! I promised to show her how to make those seams meet in a swirl and lie perfectly flat. For that she needs firstly to ensure that her seams are pressed in one direction. I tried looking for a good tutorial that teaches you how to do it , in vain. 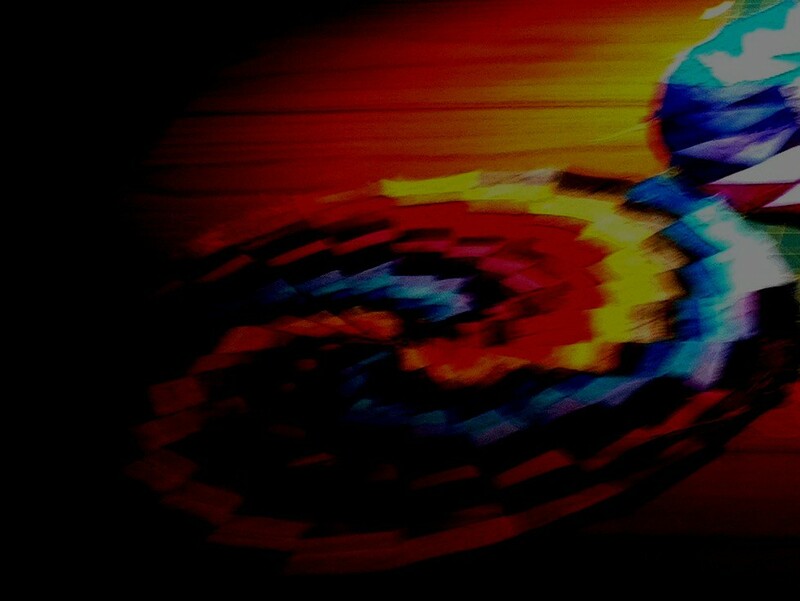 It is very similar to the what you would do in a pinwheel block. She has not got back to me on this, so perhaps she has found a solution? When I make my block, I will share with you (and Anuradha) how to make the wrong side of your block look like this. A star on th wrong side of an eight point star – tute coming up, soon! The front is perfect, all points matched, just so. Here it is, Anuradha’s gorgeous Venus Block, flipped over, from the right side. The Venus, shining brightest, amongst all the twinkling stars! Now is that not absolutely gorgeous? Anuradha’s block is ready, waiting to see yours ! Meanwhile, the Venus song is stuck in my head. Before I log off, here is a look at the Rainbow Venus, in its original avatar. And finally the Instructions and templates in pdf format. Remember, print at actual size! You need Adobe Reader to be able to read these files, Adobe Reader is downloadable for free. 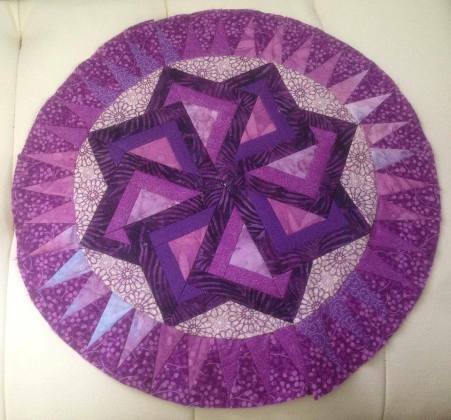 Instructions file – Venus, Block 5 of the Round the Year Quilt. 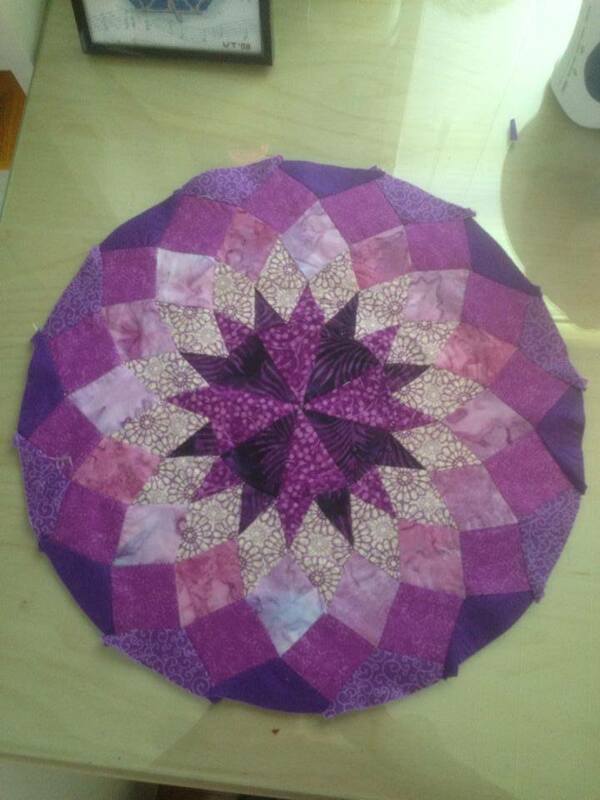 The step by step piecing instructions and pics are included in this file, page 3 onwards. If you do not want them, print only the first 2 pages. While all my Dreamcatcher patterns are free and will continue to remain so, may I suggest you visit the webpage of my favourite not-for-profit organization Samarpan Foundation and donate whatever you deem fit towards the wonderful work they are doing to spread joy, peace and happiness through the world? Thank you! 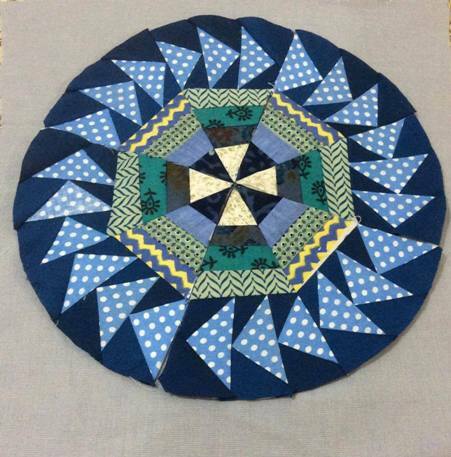 So here we are, on Layout Option 3 for the blocks for the Round the Year Block of the Month Quilt. You may also like to see Option 1 and Option 2 , which were posted quite some time ago! This layout, inspired by the Chopsticks Quilt Pattern found on oneworldfabrics.com, is my favourite! I shall probably be using this for my quilt, using two shades of blue for the background, instead of the greys here. This makes a 100″ x 100″ quilt, with plenty of negative space to showcase each block and to show off your quilting! Bonus – you get to use all of your scraps for the chopsticks! With this, my work is done. I am yet to join the circles to the squares, I will be stay in touch as I share with you my learnings during the process. I hope you have been enjoying this whole journey, which now nears its finish line! Happy quilting and please keep sharing your blocks on my Facebook page! I see to have hit some kind of a mental block trying to do calculations for the Layout Option 3 for the Round the Year Quilt. So I decided to share the real blocks that people have been making, using the free Block of the Month patterns on this blog! 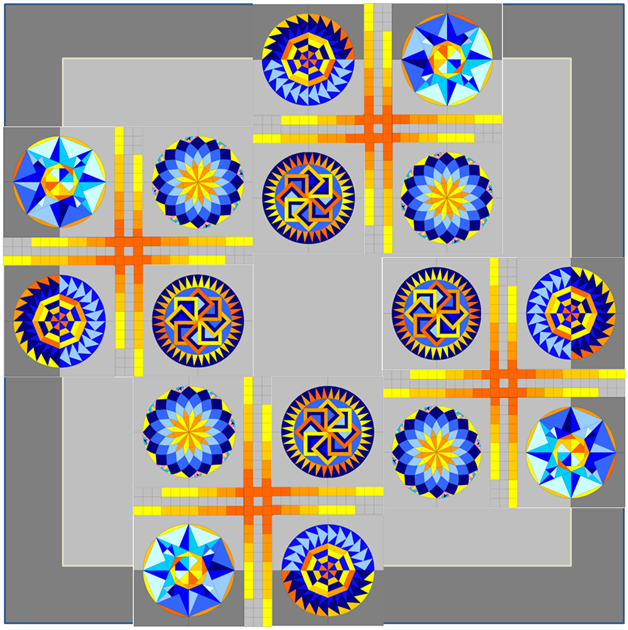 Links to the patterns for these blocks are given towards the end of this post. Diptee Raut’s geese circle a green-blue algae infested pond against the pink sunset! 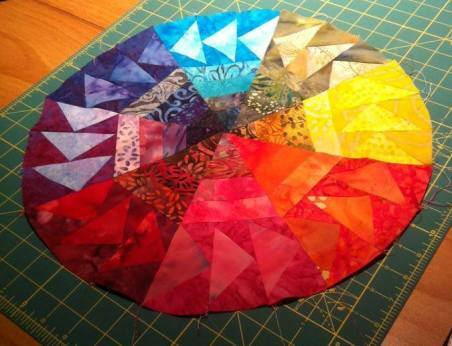 Jaya Parker’s gorgeous colour wheel! 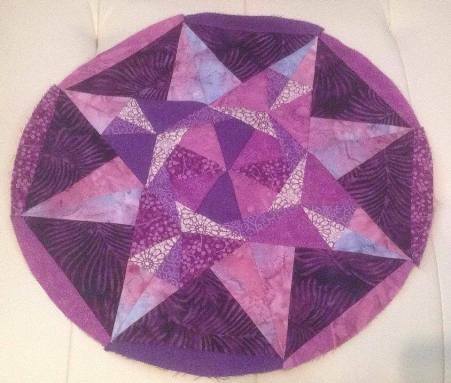 Vicki’s Sapphire Fire – actually, her Amethyst block! This is the test block that Anuradha Ramesh did for me , Block 4, Sapphire Fire. 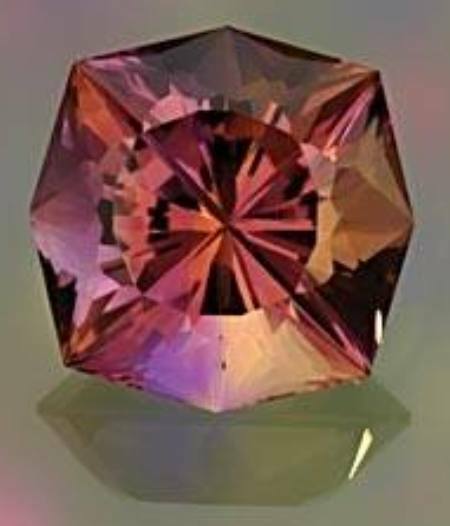 After Anuradha finished this block, I came across a picture of a gemstone that is uncannily similar to her block – the Ametrine. Those of you who are interested, can find the block patterns on these links. There are step by step instructions for making them, too! When the amazingly talented Tina Katwal of Holy Scrap! Invited me to participate in the “Around the World Blog Hop”, I immediately said yes! Tina can rightly be called one of the queen bees of quilting in India. I love the whackiness – the flash of genius – she brings to her work. 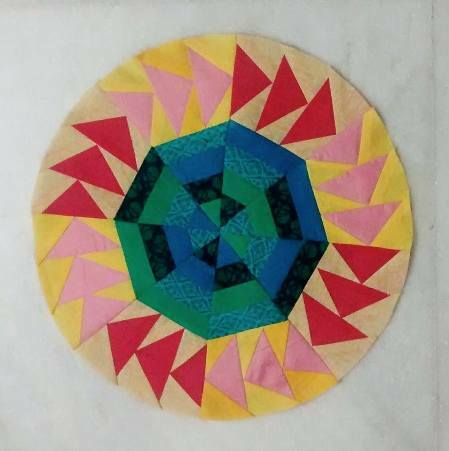 Tina administers Desi Quilters, a great online group for Indian quilters across the world AND she also runs a lovely Bernina store in Chennai, The Square Inch, dedicated to crafts supplies, classes and what have you! I am supposed to answer a few questions which will give you an idea of what I do and why, before I introduce you to the quilters who will take this chain forward! Let me warn you, I love to talk – so here we go! Well, on the sewing machine, actually and sadly, nothing for the last five weeks. I have been on enforced rest because of sciatica. When my doctor forbade me to sit, ( I am allowed to stand or lie down – neither being conducive to sewing!) I had just finished this quilt for my son and daughter in law for their first wedding anniversary. The Oh, Fransson! Mod Mosaic pattern blocks were made by members of my online quilting bee. But you can’t keep a quilter away from her quilts can you? So I have been spending my time reading some wonderful blogs, drooling over some lovely quilts on pinterest and flickr and adding to my about-to-explode list of must-make quilts! Okay, but I have also been doing some work – a lot of fine tuning of designs and fresh designing too. 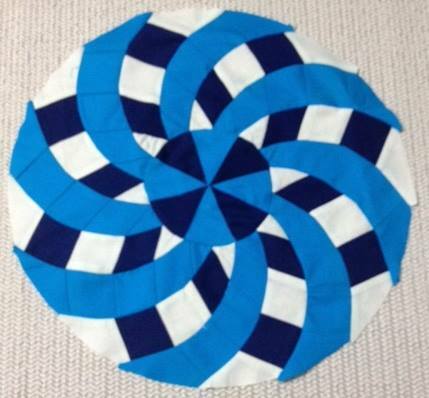 Beginning July 2014, I am hosting a free Block of the Month quilt on my blog, Round the Year. I am doing the quilt in two colourways – four blocks are already up! That was the Dusk colourway, and here is the Rainbow. I decided to utilize my time away from the sewing machine to try various quilt layouts on Quilt Assistant, a great free quilt design software. I am currently also drafting foundation paper piecing templates for the Nearly Insane Quilt, which is next on my list of to-do-quilts, as soon as I can get some half a dozen UFOs out of the way! Like this Just Takes-2 2012 quilt top, lying ready to be basted and quilted, for over a year and a half now! I like working with strong, striking colours. I love the beauty and symmetry of traditional quilt block patterns, but I like to put my own twist on them. I also like patterns, designs and techniques that challenge me – which teach me something new every time. I don’t think I can make a quilt where I would be required to piece the same block again and again and again! It would bore me to tears! This is probably the reason I like to make small quilts. Here are my experiments with the wedding ring and cathedral window blocks! These days, I have come to be captivated by the design element in `modern’ quilts. I find myself incorporating negative space in my quilt designs – also because I wish to practice free motion quilting, which I have embarked upon recently. I do not have access to modern fabrics and am not sure if I would use them in my quilts if I did. I hate slipshod, untidy work! My points must match ‘just so’! So Jack, the Ripper, is my closest friend when I sew. I am. Therefore I create. I create. Therefore, I am. Like the blurb on my blog states , “This and that, some rhyme, not all reason“. I don’t think I could live if I did not create every day of my life – paint, write poetry, embroider, design or quilt. Design Process – calculations galore! For my sewing area, the `Hippie Happy’ quilt… I tried a lot many techniques here, for the first time. The Hippie Happy Quilt – Peace, Soul and Tranquility! Here is a panel from a counting quilt inspired by the most beautiful little girl, born to a favourite niece! Seven kites, eight clouds, nine stars – all in in silk and satin! And finally, pictures of a quilt inspired by a wedding in the family, coinciding with the Husqvarna Viking India quilt challenge. In this quilt, I loved bringing alive the magic of the winding ways block, sewn together to represent the sacred fire which forms an essential part of the Hindu wedding ritual. The Saptapadi Quilt won me a Husqvarna Viking Sewing Machine ! This is the sacred fire circumambulated by the couple during the wedding ceremony. Thank you for visiting my blog. Hope you enjoyed looking at these pictures as much as I enjoyed sharing them with you! Before I sign off, I must introduce you to my tag-ees for the next week. The first is the beautiful, multi-talented Brinda Crishna, whose signature style is traditional Indian fabric and hand quilting! She embroiders; she crochets, amongst other things, the most delightful little animals for her lovely grand children; she does water colours, and maintains the most fascinating hand written journal with her lovely sketches of everyday happenings. I do hope she will share some of this other stuff with you too; don’t forget to head to her blog http://embroideringmytale.blogspot.in/ next Monday, 13th October, 2014. 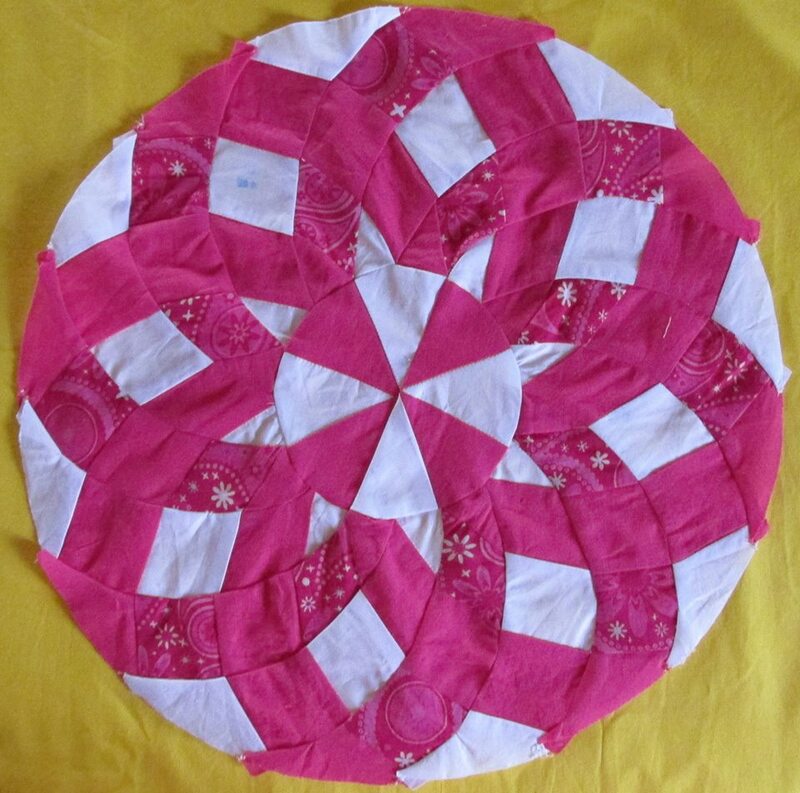 My other tag-ee is Sobana Sundar, at her blog http://thequiltbug.blogspot.in/. Sobana lives on a self sufficient farm, growing her own vegetables and fruit, besides gorgeous water lilies (which she has immortalized in a pretty little quilt!). She loves embroidery, especially cross stitch, besides of course, quilting! She was more of a traditional quilter till very recently, but is becoming decidedly more adventurous now! She too will be sharing with you what makes her (quilting) tick, on 13th October, next Monday. The third quilter I am tagging is also from India, the gorgeous Elvira Threeyama! Her trademark is a great choice of fabric and the neatest, crispest finish you would see on anything that went under a needle – whether a quilt, or a wallet, pouch, bag, tote or even a skirt or a pair of trousers! She blogs at http://chez-vies.blogspot.in. I hope you will check her great sewing and quilting next Monday! Keep quilting and dreaming of quilts!